Share this sweet treat with your kiddos this Valentine’s Day and they will heart you forever! Plus, make sure to keep this recipe handy for when summer arrives! I bet it would make the perfect frozen treat for those super hot summer days. My girls are always asking for a sweet treat and this is recipe is one of the ones we make when we stay at the beach during summer too. It’s refreshing and tastes delicious. In a small saucepan, add the raspberries and sugar. Simmer for 4 to 5 minutes on medium heat. Refrigerate raspberry puree in the refrigerator for about 2 hours. In a large pitcher add raspberry puree and strawberry lemonade concentrate. Stir in 1 bottle of Sprite and serve immediately over ice. 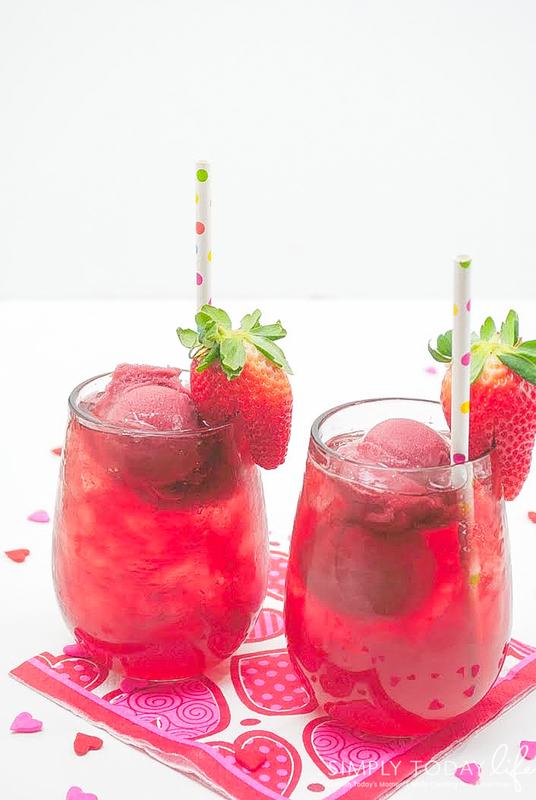 Pour into a cup or glass and add a few scoops of frozen sorbet. Not only is this recipe super easy to make, but your kids will love it! I’m always looking for easy recipes to share at my girls Valentine’s Day parties at school when I volunteer to help. The kids love it and it makes the party just a little bit more festive. 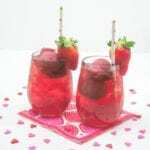 This Valentine’s Day Punch recipe is also perfect for adult celebrations and parties. You can be so creative when it comes to this drink recipe. Make it for kids or adults, either way, it will be a huge hit at your next party. 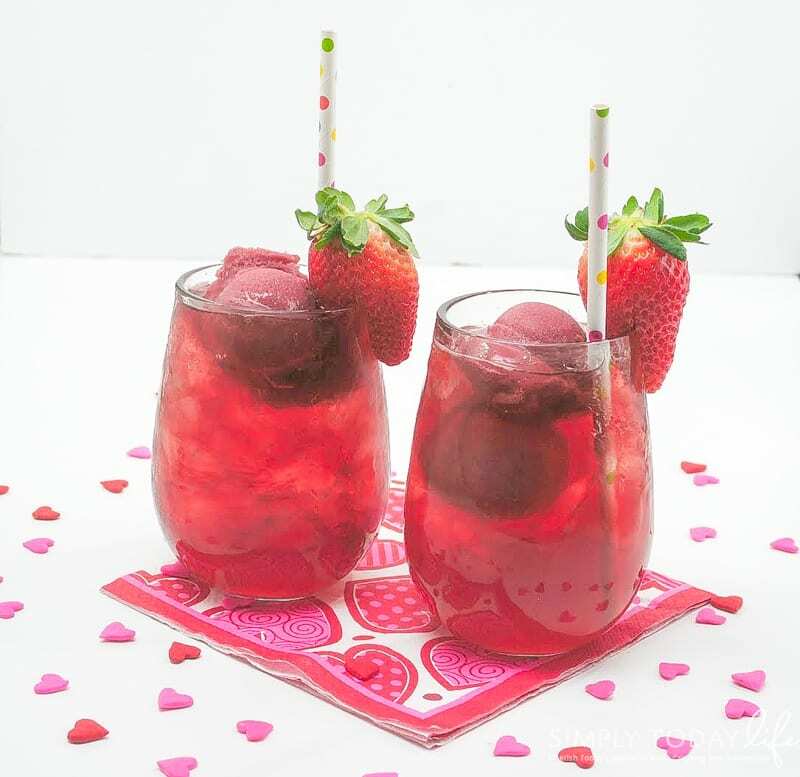 Does your family love a delicious Valentine’s Day Punch? I have never done anything like this and I think my kiddos would love it! Gonna give it try on V-day!Thanks for sharing!! What is floating in the punch? I read the instructions and am not understanding what that is? I thought possibly it was the strawberry lemonade concentrate, but the recipe states that it is thawed. Am I missing something? Hi Elizabeth, thank you for catching that. It’s strawberry sorbet. Just add a scoop or two to your berry punch 🙂 I will edit the post to make sure that is added. Thank you! About how much will this make. I’m wondering if it is enough for a classroom party of 22 first graders?